The basic hookah is the first stage, 50’ of air hose, and the second stage regulator. I added a pressure gauge to the second stage after the photo was taken. I have a fair amount of diving experience. I earned my PADI card when I was 17. I’m also a military trained diver and served in dive billets for nine years. But I don’t have diving gear anymore and I think I made my last dive about 2003. I just snorkel now. But I always think about options…. Beating back against the NE Trades from Culebra to St Thomas. After a wonderful week in Culebra it was time to head back to St Thomas. Unfortunately, St Thomas is about 20nm dead upwind against the powerful Caribbean trades. We prepared the afternoon before by stowing gear and stripping the sun awnings and sail covers. We hauled Sweet Pea up and inverted her on the cabin top and snugged her down securely in her teak chocks. The Far Reach has proven to be wonderfully comfortable during extended live aboard. For the last month or so it’s been pretty easy living. The Far Reach and I have mostly remained here in Elephant Bay, St Thomas until Gayle could join us. The pace of living has been slow and relaxed. There has been plenty of time to read, sleep, swim, eat, study the sky, think, and meet new people. Sweet Pea, our tough and hard working 9’ Fatty Knees dinghy. Until recently, while anchored in Elephant Bay, I had been rowing in and out of Crown Bay Marina in St. Thomas, USVI. I purchase water there and sometimes ice. I load up to 35 gallons of water at a time, in seven 5 gallon collapsible jugs, to haul to the Far Reach. I also use the dinghy dock to get a beer or occasional meal at Tickles Pub or grocery shop around the corner. Water hauling day: 35 gallons or 280 lbs of water. Our 9’ Fatty Knees has been a real work horse for almost 15 years. She’s tough, rows well, and with a 15’ tall mast carries a lot of sail for her size. I can’t imagine trading her for an inflatable. As part of our “keep it simple” approach to all things sailing we have developed a system for filling the water tanks on the Far Reach. It didn’t happen all at once…it took a little time and some trial and error. I slipped out of Jost Van Dyke early on 30 December. The anchorage was already getting crowded in anticipation of the big New Years Eve bash. The night before I left, while I was ashore helping Baba, a 62’ private charter cat anchored way too close on the starboard side of the Far Reach…exactly the reason I wanted to get out of Great Harbor. The FR and the cat got much closer than this photo depicts. My 13th Day at Jost Van Dyke. I have spent the last 8 days helping out Ali Baba on whatever projects he has lined up. Painting, helping run wires, building a booth for the New Years festivities, etc. I have really enjoyed working with Baba and getting to know him and Urinthia. They have fed me and engaged me in interesting wide ranging conversations. I have learned a little about Island culture and got a peek or two about what goes on behind the scenes. I have traveled all over the world yet never cease to be humbled by the kindness so many people extend to people they barely know. There is nothing that demonstrates how we are so much more alike than different like foreign travel especially when you engage outside your own community and culture. I’ve known Baba and Urinthia for three years. If you want disco and loud music Foxy’s is the place to go. But this is where the best food is on JVD. It’s a great place to bring a family or a friend and have a slow meal and a long conversation. And Baba also has a fantastic and diverse play-list loud enough to hear but quiet enough not to interfere in conversation. Anchored in 10’ of gin clear water on a sandy bottom in Great Harbor, Jost Van Dyke. I departed Beaufort, NC on the heels of a low pressure system and after 12 days at sea made landfall across the north bank of the British Virgin Islands. I cleared in through customs at Great Harbor, Jost Van Dyke where I anchored in clear blue water on a sandy bottom. The jalousie window keeps rain from being blown into the cabin when the wind is aft yet helps to maintain ventilation. To install it just swap it out with the center drop board. 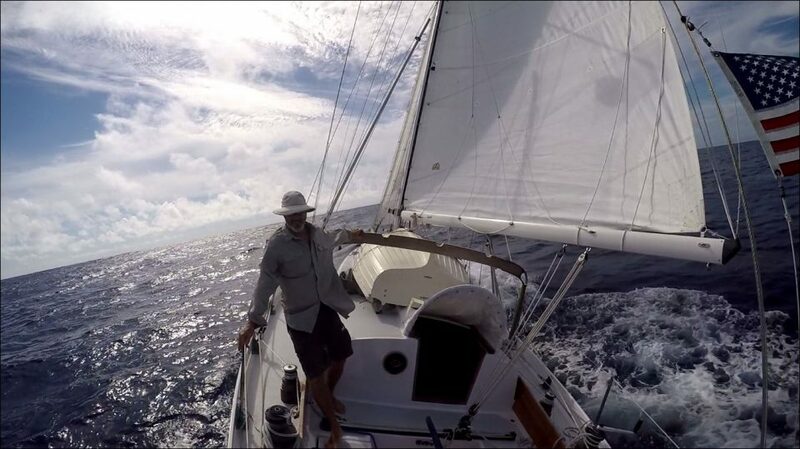 During my last voyage to the BVI, and especially on the downwind sail home, it became evident to me that life aboard would be improved if I could prevent rain from being blown into the boat through the companionway from an aft wind while at the same time maintaining airflow in the boat. The new hatch lock conceals the bulk of the brass barrel bolt and makes it stronger. It also can’t be reached from the bridge-deck. One of the things I have not liked about my boat is I have no way to lock the companionway from the inside. It’s an odd thing when you think about it. When I rebuilt the boat, though I made a lot of changes, I kept the basic design of the original companionway intact. This is an important capability when you are sleeping on the boat and you can’t lock the “front door” so to speak. You are therefore vulnerable. I heard about more than just a few boats getting boarded at night when I was sailing in the West Indies.